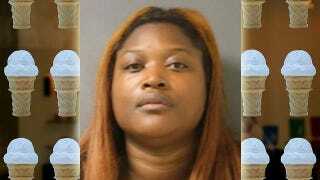 A 34-year-old mother crashed her car into a Houston Metro bus on Friday with her three kids in the car. She left them in the wreck, not to get help, but to get an ice cream at a nearby CVS. Then she started stripping. She resisted arrest when officers arrived. She has since been charged for child endangerment. The children, ages 5, 12, and 16, were not seriously injured in the crash, other than a large gash over the eye of the woman's 5-year-old. They have been put in the charge of their grandmother. In the woman's defense, it was very hot that day.